No, not like you’ve just found out that your favourite TV series has been discontinued. The cycling round in muddy fields and sandy beaches with hundreds of other whippets dressed in lycra with mud-spattered faces- the good sort of cross. Cyclocross! When all your roady-only mates are hiding away for winter training on their turbo’s. Refusing to come out in the cold and wet weather, crossers are getting ready to do battle on skinny knobby tyres. Cyclocross continues to go from, strength to strength and it’s fastest growing competitive cycling sport worldwide. We’ve long been huge fans and have a CX bike line-up with quality and depth that we think is unmatched. Here are two of our most modern CX bikes, featuring the best of our titanium and carbon fibre framesets with SRAM’s Rival1 HRD groupsets and top-notch finishing kit. The XLS name is a byword for value and performance in the cyclocross market. 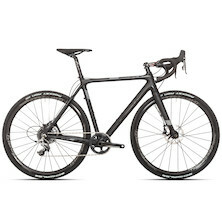 One of the first full carbon cyclocross bikes to be equipped with disc brakes it offers a mind-blowing mix of riding performance and confidence inspiring handling. The XLS is still our best-selling carbon CX bike and this new build featuring SRAM’s innovative 1X Rival drivetrain and powerful hydraulic disk brakes. The XLS represents the evolution of technology within cyclocross, namely, the introduction of disc brakes. If you're a road rider that's never experienced disc stopping power, you'll be thrilled with their performance. No longer must you compromise on speed - on discs you can brake later into corners and shred mud like never before. This performance increase is even more outstanding when coupled with the XLS' lightweight carbon frame and fork. We've cleverly flattened the top-tube profile for comfy shouldering over the roughest off-road terrain, too. There’s big tyre clearance, too, to avoid mud clogging. With features like these, we've made sure the XLS is future-proof. The XLS frame is beefed-up around the main frame joints for extra strength so it can easily handle the rough stuff. In fact, the XLS wants to be ridden hard, to show off how efficiently it transfers every watt of pedal-power into speed. Go on, drop the hammer, search for the limit, gap the field. SRAM’s Rival1 HRD groupset mixes up the wide gear spread and rock-solid chain retention that it’s off-road racing groupsets are known for. Narrow-wide chainrings and a clutch rear mech are in full effect to ensure you’ll never drop a chain no matter how rough the going gets. Powerful hydraulic disk brakes come as standard and are unaffected by weather conditions; wet or dry they offer the same great, instantaneous stopping power. If you’ve only ever used rims brakes you’re in for a big surprise the first time you grab a serious handful of anchors. Of course, the XLS is way more versatile than just being a pure race machine, you’ll see them being used as daily drivers in the city and as gravel bikes at the weekend, and that’s one of the reasons why they’re a best seller all year round. Titanium sits head and shoulders above all other metals used for building bicycles. It has a blend of strength, stiffness, durability and striking good looks that make it an easy choice for the discerning cyclist. As well as being made from the right-stuff the Pickenflick also has that something special that every CX bike needs, sweet handling geometry, off-road comfort and a real spring in its step. Everyone knows the Pickenflick it’s a multi-award winner and the bikes that defined a genre. Over the years we’ve subtly revised and improved it, honing it handling, poise and acceleration and it can justly lay claim to being the first CX bike that really offered a whole lot more. Lightweight butted titanium frame tubes are welded together with incredible precision, showcasing the finest of the framebuilder’s art. For this season it gets new acid etched graphics as well contrasting with the rich satin brushed frame finish. It’s out best Pickenflick yet. Of course, the Pickenflick still has masses of tyre and mud clearance. There’s space for 42mm tyres if that’s what you desire; they might not be Cyclocross standard issue but they’re great for those rough’n’tough adventures. SRAM’s Rival1 HRD groupset is all about simplicity that you can trust, no one ever wants to throw a chain when they’re racing and the SRAM’s 1X drivetrains have pretty much made that occurrence a thing of the past. An 11-42 cassette mates with a 42t chainring via a clutch rear mech to give a huge gear range while still offering rock-solid chain retention. Powerful hydraulic disk brakes come as standard and are unaffected by weather conditions; wet or dry they offer the same great, instantaneous stopping power. Disc brakes are the perfect solution to your wet-weather stopping woes. Rolling on Gipiemme Roccia 700c wheels the Pickenflick Rival1 HRD is a force to be reckoned with on the CX circuit. 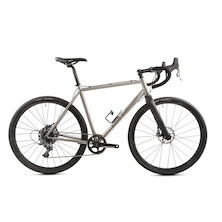 It’s a tried and tested award winner that has been honed and improved, it might just be the best performing value for money titanium cyclocross bike that you can buy. Grab an extra couple of sets of CX specific tyres and you’re ready to race.